Thank you for shopping at EOM's online media store. We pray that you will find something that you like. All proceeds supports our global outreach ministries. We strongly believe in reciprocity in according with Luke 6:38 (KJV), give, and it shall be given unto you; good measure, pressed down, and shaken together, and running over, shall men give into your bosom. For with the same measure that ye mete withal it shall be measured to you again. EOM Radio Station offers many opportunities where you and others can be blessed; start participating today. Spread the word that we are "Bombarding the Atmosphere with God's Essence. This introductory CD, "The Mark of the Beast is a revelation which God gave to Chief Apostle L. C. Dunbar concerning the plans of the Devil for mankind. God uses Apostle Dunbar to reveal the numbers 666 in the microchip technology and the image of beast. It also serves as a warning not to receive the implantation of microchips in your body. Buy it today for $10.00 and start teaching your family and others about the mark of the beast. Add it to the cart below. 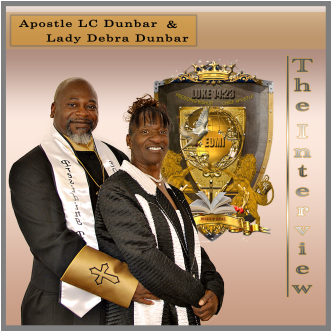 You will enjoy this interview with EOM Chief Apostle and Lady Dunbar as they talk about their experiences. They discuss God's purpose for Evangelistic Outreach Ministries International as global outreach ministry. Buy it today and hear the full details of their life journey for only $10.00. You will be encouraged and blessed by this man and woman of God. Add it to the cart below. The EOM Radio Station (ERS) Manual was designed for any one that desires to become a Sales Rep. There are three types of Sales Rep positions, associate, district, and regional. Reps can earn up to 20%, 30% and 40% per sell. If you are interested in earning extra money, order the manual for only $8.00 and get specific details. Once you make your first sell, ERS will reimburse you the cost for the manual. Purchase the manual now my adding it to the shopping cart below. The EOM Radio Station Franchise book was written for anyone that wants to start an internet radio station. The EOM Radio Station’s internet business model is safe and cost effective for anyone that desires to start an internet business. Our staff can help you setup and get started within 90 days from the time you purchase the radio station franchise. Your potential earning could range from $3,000-$5,000 within 6 months. Buy our franchise book today for $10.00 and see how easy it is for you to start your own internet radio station franchise. Add to the cart below. The Heavenly Vision Scholarship Program book shows ministries on how to develop and implement a scholarship program from 1st to 12th grades. This book provides youth leaders applicable information on why they should invest in a church/ministry educational program. Children/youth could earn up to $6000.00 by the time they graduate from high school along with preparing them for a higher education. If you are interested in educating children/youth and preparing them for a brighter future, buy this book for $15.00 now by add it to the cart below. To God be the Glory for making our first Holy Convocation a success. A special thanks to those who persistently worked and endure the faith; you made a difference. Through it all many souls was saved and delivered. You can get a copy of our 1st Holy Convocation book for only $5.00. Add it to the cart below.